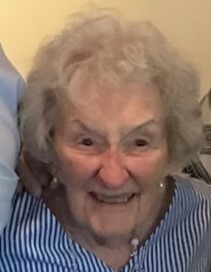 York Beach, Maine - Leah M. Jacobson, 84 passed away at home on April 8, 2019. Leah was born January 6, 1935 in Medford, MA a daughter of the late George I. and Bertha (Cobb) Chase. After graduating from Medford High she began her career at John Hancock in Boston, MA. Then she moved to Dracut, MA after marrying to raise her family. She later became church secretary at Christ Church United for many years. Eventually she became the Tax Collector for the Town of Dracut. Upon retirement she moved to York Beach, Maine which was her dream. In her retirement she enjoyed first and foremost her grandchildren. She cherished their visits to "Mayberry" as they would call it because Grammy was old school and didn't even have a microwave. She also enjoyed gardening, baking, line dancing, traveling and the beach. She is survived by her son Steven Jacobson and his wife Laurie of Marston Mills, MA and her daughter Beth A. King of York Beach, ME; her grandsons Scott Jacobson of Wilmington, DE, Daniel Jacobson and his wife Amy of NYC and Kevin Jacobson of Dracut, MA; her sister Gail Sexton of Centerville, MA; many nieces and nephews. Leah was preceded in death by her sons Harold and Eric Jacobson and her brother Kenneth Chase.